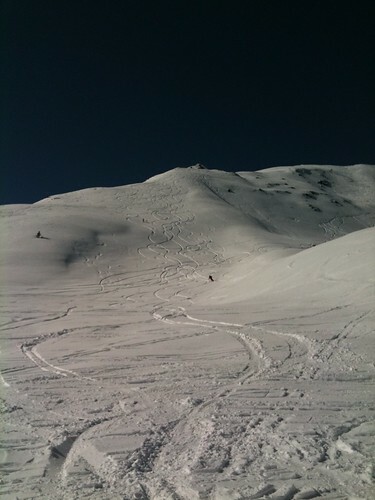 on thursday, the 3rd of march 2011, we drove to zell am see in salzburg to attend a freeride experience weekend there. we arrived in the afternoon, checked into our room in thumersbach (right across the zeller lake) and then visited zell am see. we went to see the la resistance shop and randomly ran into sepp, who we know from wakeboarding, there. he spent his winter season in zell am see and works at the la resistance shop. we chatted for a while and then left to get something to eat. afterwards, at 8pm, we met up with the other group members in the lohninghof, right next to our hotel room. we were quite suprised at how big the group was. the guides bengt and gerry went from table to table to talk to everyone and see if anyone was missing. they also told us about the plans for the next days and when we would start on friday. so, friday, 8:30 am it was. we met up in front of the lohninghof, jumped into the vw busses that were our taxis and went to a sports shop in zell am see. 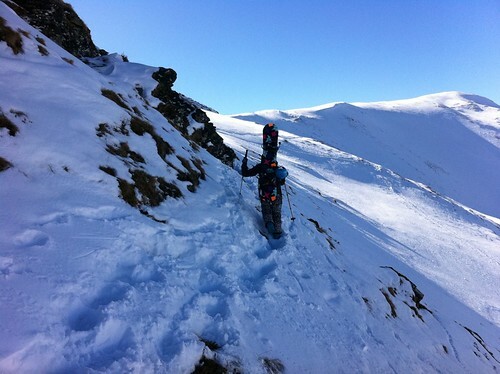 the skiers received their rental equipment there, aswell as avalanche beacons, shovels and probes. at about 10 am we arrived in saalbach hinterglemm. the sun was shining and everyone was looking forward to the first day of freeriding. we got split into 3 groups with 7 to 8 people. our guide was gerry. we started with some runs next to the slopes to warm up. afterwards, we hiked up to the peak next to the chairlift. this took us about 30 minutes, then we had a short break at the peak. we proceeded to ride down from the peak. next up was another short hike. this time, we didn’t hike up to a peak, we just crossed over for a bit and then did an awesome run down to lengau. the snow was a bit wet and heavy, but still it was way better than expected! when we arrived down in the valley, we had to push out to the next village for about 5 kilometers. we were all pretty exhausted after that, so we decided to take it slow and have a drink and something to eat. after that, we went back to zell am see (thumersbach). in the evening, we met up in the lohninghof for dinner. i had wonderful spinach dumplings… nomnomnom! first lines. well, OUR first lines 😉 everything was rather tracked already! saturday, 8:30 am. we met up in front of the lohninghof and went to the kitzsteinhorn. i was expecting to find a bit more fresh powder there, i have to admit. 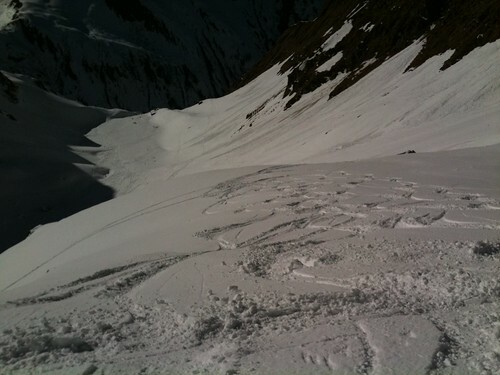 i was a bit sad to see that all the freeride routes (they have 5 which are avalanche safe) already had been ridden a lot. but no need to worry! gerry knew where we had to go to find fresh pow. we hiked a bit and then – booooom – there it was! a wonderful ride down from the kitzsteinhorn to niedernsill, lots of untracked, cold snow… it couldn’t have been any better! on sunday, we went to saalbach-hinterglemm again. we went up with the zwöflerkogel gondola again. then we also took the seekar t-bar to the top, just like on friday. this time though, we didn’t just hike a short bit, we hiked about an hour to reach another peak. the skiers put on their skins, roman and me simply walked (without snowshoes, there was no real need for them). 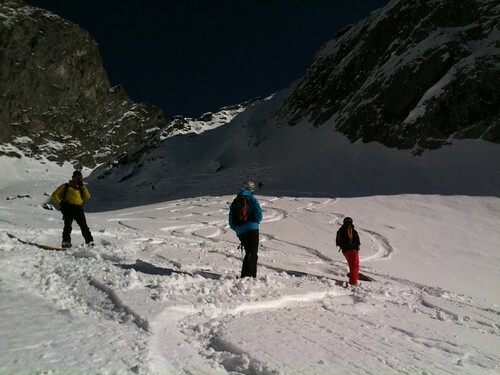 we were lucky and found a bit of powder on our run down to lengau again. a video is still in the works! Categories: adventures, riding | Tags: austria, freeride experience, freeriding, hiking, kitzsteinhorn, saalbach-hinterglemm, salzburg, snowboarding, sports | Permalink.